Although the concept would be very useful this project didn't work out quite the way I wanted but does have some potential. Mounting a bike onto a trike has the potential for problems because of the inherent way they work. 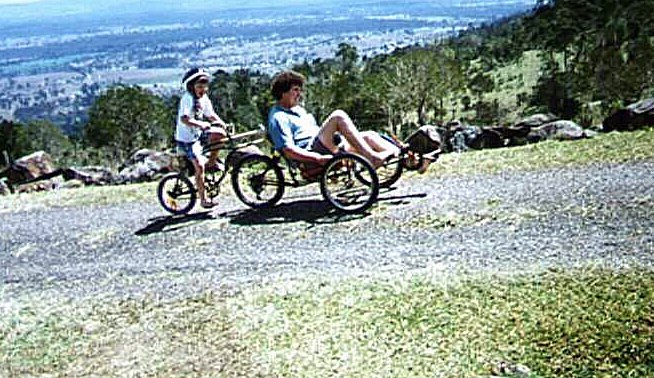 The bike when pedaled tends to destabilise the trike with side by side movements and it could have been improved upon by making the bike trailer recumbent with a lower centre of gravity as well as having 2 rear wheels. The bike trailer needs to be able to pivot side by side in a turn and up and down when in dips. The bike trailer needs to be held up vertically. I made the coupling using the front forks and seat bracket of a push-bike. The fork legs were cut off leaving enough room to mount a seat bracket. This bracket bolts onto a seat tube on the trike. The seat bracket used as the up and down pivot and the front forks for the side by side pivot. The steering head tube could be mounted vertically or better still tilted forward which would have the trailer lean into the turn. The nuts used to hold on the bracket need to be the type with a nylon insert (sometimes called nylocks in Australia) so they don't undo with movement. 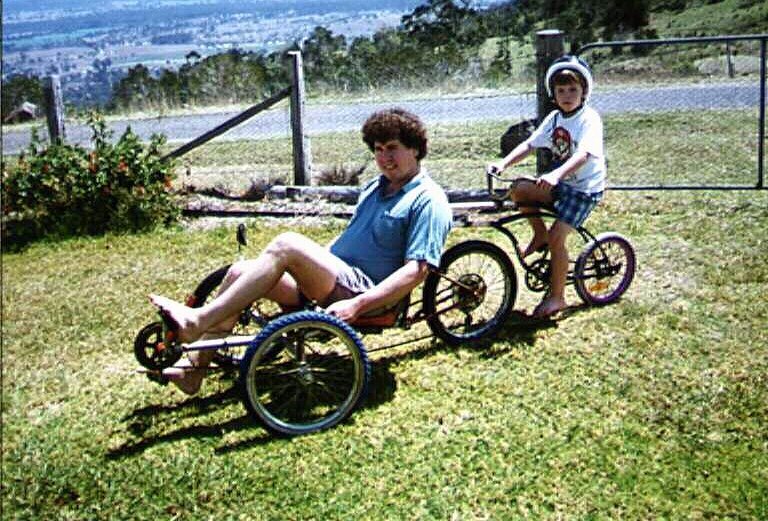 For some other trailer ideas check out the Novel HPV Ideas page the electric assist single track Trailer, recumbent bike trailer as well as Birth of the Trailerbent.